Private Sector Enterprises- These are the businesses which are owned, controlled and financed by a private businessman. There is no government participation in such form of business organizations. 2. Profit motive - The main purpose of   Private sector enterprises is to earn Profits. 4. Independent Management -  Private sector enterprises are  managed independently by the owners. 5. Private Finance - The capital of private sector organization is arranged by the owners themselves. 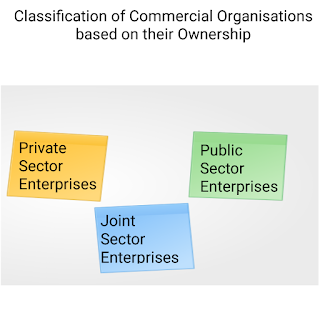 Public Sector Enterprises - These are the businesses which are owned and controlled by the central or state government. 3. Service Motive - The major objective of such organizations is to provide services to the citizens of the country. 4. State Finance - The funds required to run these companies is provided by the government. These funds are provided either through budget or by way of loans. 5. Public Accountability -  These undertakings are accountable to the public at large as tax payers' money is utilized by the government to invest in such companies. Hence the audit of such companies is carried out each year by the Comptroller and Auditor General of India (CAG).